Starting a trading card blog is one of the best things that I've done in my life; well, outside of getting married, landing a steady job, purchasing a new car... that kind of adult, "real world" stuff. On a personal level, however, starting Wrigley Roster Jenga has provided me an outlet for my favorite hobby, a venue to keep my writing skills sharp, and introduced me to some particularly great people in this internet community, people that this introvert would have never known existed, otherwise. This community of cardboard keyboarders is almost like an online family - we discuss, we look out for each other, we send random gifts, etc. Recently, I've had the pleasure of adding a new name to my circle of cardboard kin - Mr. Kin Kinsley, of Bean's Ballcard Blog and I Feel Like a Collector Again fame - and he has already checked all of those boxes. 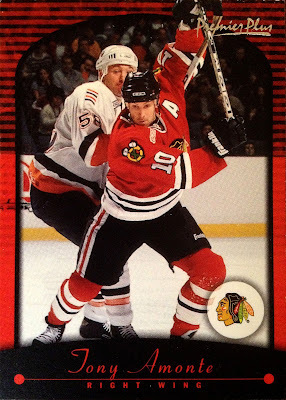 Kin might not like the Cubs (at all), but we've got some common ground in Indy Car racing and Blackhawks hockey. A couple of days ago, after a long day at work, I was thrilled to find an unexpected bubble mailer filled with card of the latter, courtesy of my new cardboard "Kin." 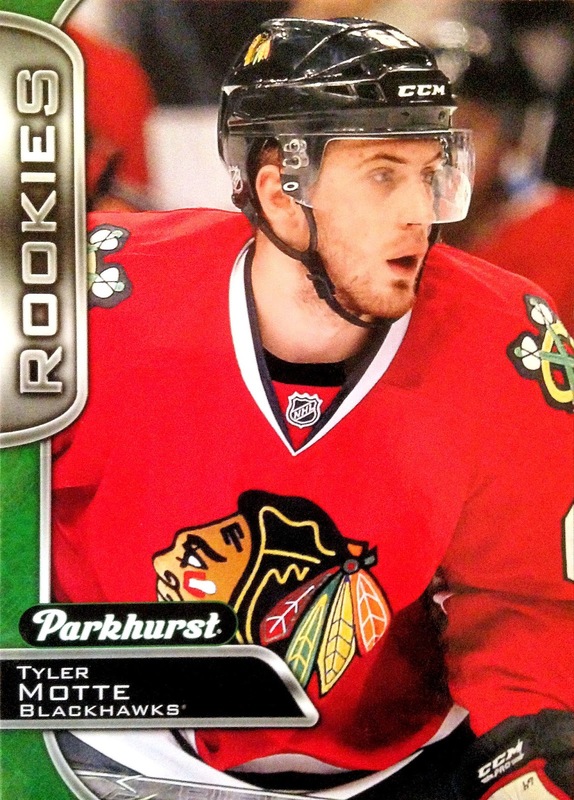 Mr. Kinsley noticed that I'd mentioned needing Tyler Motte's rookie card from the recently-released 2016-17 Parkhurst set for my Blackhawks All-Time Roster Collection and immediately gifted me with a copy. Additionally, TVR is another name that I'd been tracking down for said binder and Kin was kind enough to toss his rookie from '14-15 OPC in the mailer, as well. The BATRC hits didn't stop there, Kin mentioned that he scanned my list of needs and did as much damage as he could, which included these two strikingly blue Starquest inserts from '98-99 UD Choice. Good thing blue is my favorite color! Neither Peter Bondra nor Sergei Samsonov are strongly associated with the Hawks; however, both spent a quick stint in the Windy City towards the ends of their respective careers, when the previous FO administration made it a game to see how many aging stars they could sign, past their prime. While their time in Chicago might not have been notable, Kin's gesture was just the opposite! Tony Amonte is a guy I have a "few" cards of, but I certainly didn't have this one. 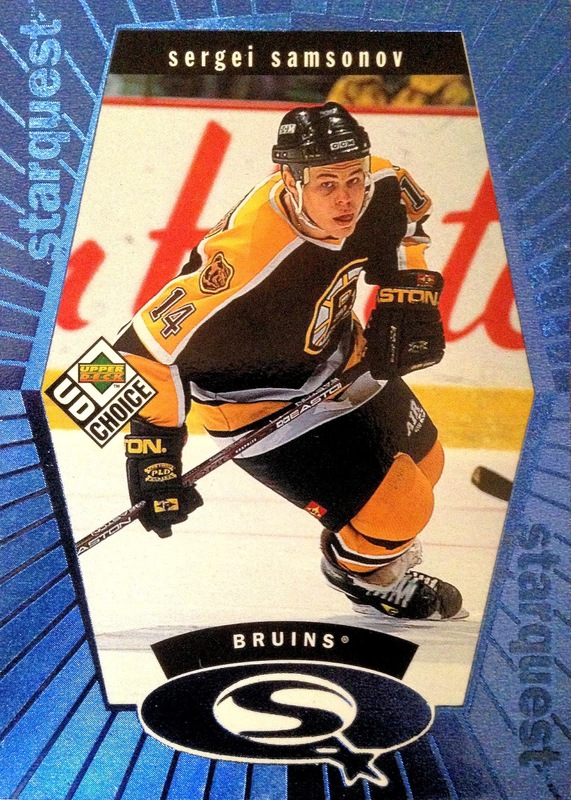 It may look like your standard, base card from '00-01 Topps Premier Plus; however, looks can be deceiving. This otherwise unassuming card is actually a pre-production promo and instantly becomes my favorite card of the right winger. Don't worry Kin, I'll give it a good home. 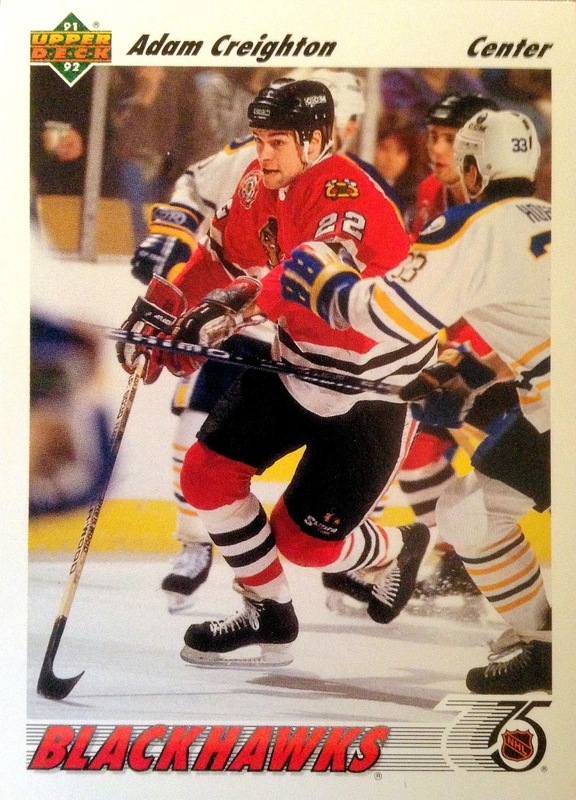 The last two Blackhawks cards to fall out of this mailer were anything but unassuming; in fact, they were quite noticeable and super shiny. They both feature a pair of Hall of Fame goalies, as well. 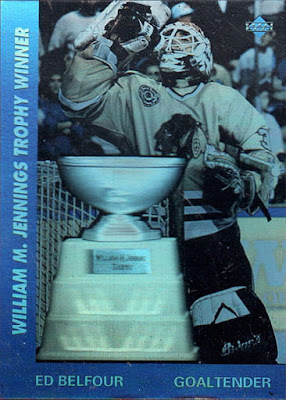 Both Kin and I agree, those holograms that were put out by Upper Deck in the early 90's were and are the bee's knees. Ed Belfour is a great name to pull too; I wonder how much these babies went for in their heyday? Meanwhile, the NHL Centennial Salute Glenn Hall is significantly newer, hailing from the new Parkurst release, like the previously seen Motte. This chromey insert set pays tribute to players on the '100 Greatest NHL Players' list, a compendium which was assembled in honor of the league's 100th anniversary. While those two goalies might have signified the end of the hockey stuff, that doesn't mean there weren't more cardboard goodies to be found. For instance, here we have an awesome oddball of hometown hero Tom Waddle, a Chicago native and member of the god-like 1985 Chicago Bears. This playing card is part of a 52-card deck called "Ditka's Picks," which was released by Bicycle in 1993. The deck supposedly revolved around "Da Coach's" selections for the 52 best players in the NFL. At any rate, I love oddballs of any sort, so this "wild card" was a more than welcome sight. To wrap up the package, how about a rookie card of a surefire, Canton-bound Hall of Famer in Brian Urlacher. 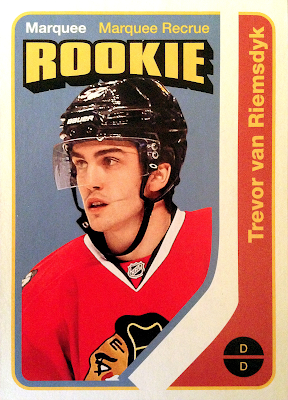 I've never been big on the rookie card bandwagon, but that certainly doesn't mean I'm going to turn them down when they come my way. 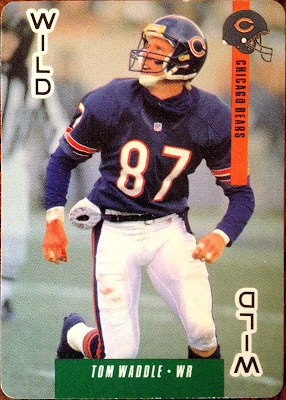 Not to mention, I have a thing for cards that depict Major Leaguers, NFL'ers, etc. in their minor league or college duds. 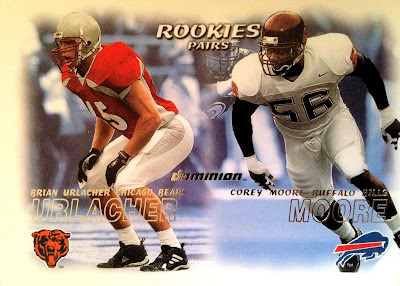 Therefore, this "Rookie Pairs" single from 2000 Skybox Dominion makes for the perfect exclamation point to close out with. Thank you, Kin, for the super awesome, super helpful and super unexpected bubble mailer, stuffed with super cool cards. Like I said, this blogging community is truly like one big family and that's what families do - we look out for each other. 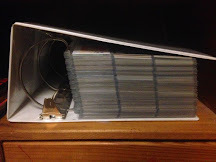 That's just what Kin did when he noticed he had some cards that would slide nicely into my collections. In return, I'll be sure to keep an eye out for any rare Andrew Shaws or open wheel racing cards that might catch your interest. Also, if the Hawks ever need another emergency goalie, I'll get a custom whipped up for you in no time. Here's to our newfound cardboard "Kinship!" The Glenn Hall is nice. I watched the NHL 100 special. You never saw so many hockey players in nice suits. And with bad knees. The videos were great. I remember Waddle famously catching balls across the middle of the field and getting creamed by the defense. He was one courageous dude. 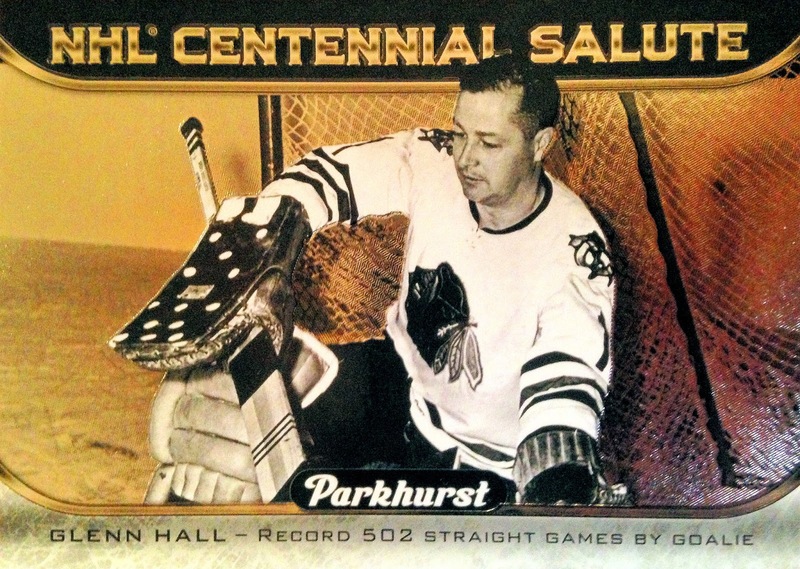 My dad told me that he was coached by Hall as a kid in baseball in Saskatchewan growing up. 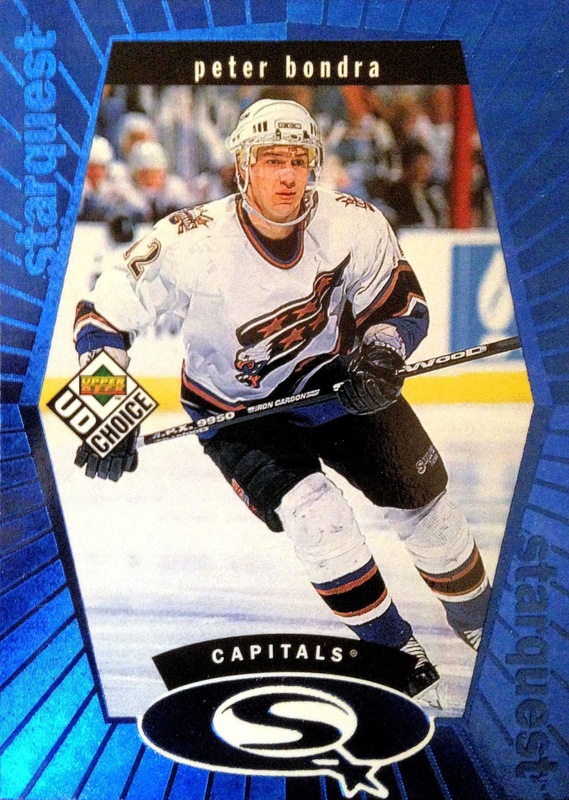 I saw Adam Creighton play many junior hockey games. Happy to help out a bit! I'm definitely a fan of sending out cards without the recipient knowing. There are a couple more Hawks on that list that I plan to help you out with in the near future, if you don't beat me to it!